Address: 134 E. Hyman Ave. This Frank Lloyd Wright-style lodge is nestled in the heart of Aspen. 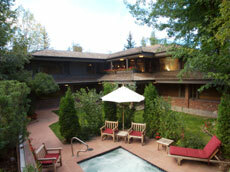 Aspen Club & Spa membership. Outdoor hot tub and indoor herbal steam room.